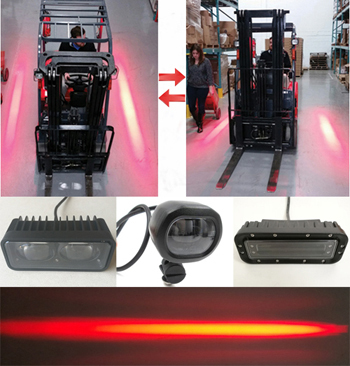 Keep out zone light,is a new design forklift safety light,The purpose of Keep out zone light is to ensure pedestrains stay a safety distance to away from the forklift.To creat a safety halo﻿ zone to avoid﻿ or decrease the forklift-pedestrians-related accidents. Now in the market,There are diffrent kinds of Keep out zone light,There are in a big quality diffrence. Our company mainly offer a good quality Keep out red zone light,Wonderful brightness with a nice light pattern,Together with a good dissipation. Splink keep out zone light,is a good choice for forklift safety control.